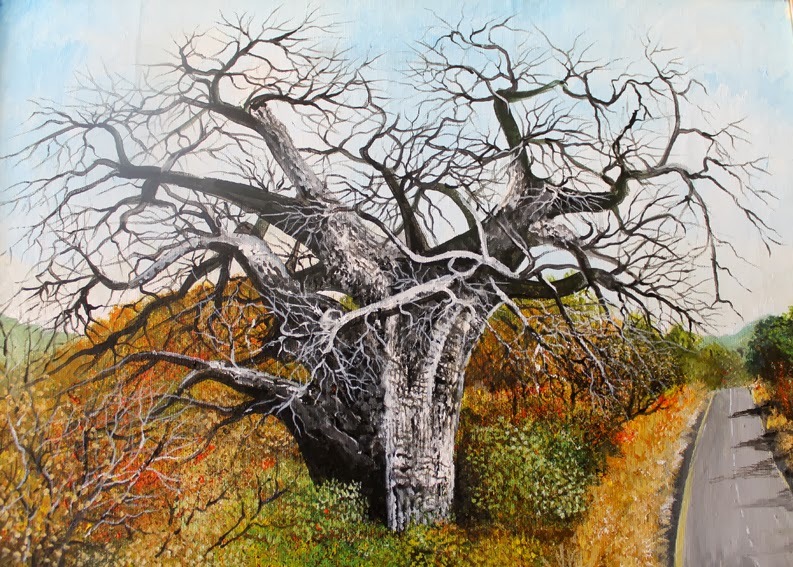 If you are in the Lusaka area and have not seen the “49 Years and Above” exhibition currently showing at the Intercontinental Hotel in Lusaka, you still have a few more days to catch a glimpse before it is pulled down on Friday next week. Organised by the Twaya Art Gallery who are now based on the second floor, it is a significant, but not very large display, the exhibition itself being spread across the hotel’s shopping mall area on the ground floor. In the curator, Roy Kausa’s vision the exhibition celebrates Zambia’s 49 years of independence although his deliberate play on ambiguity in the title also remains true to the fact that all the artists he features in this particular show are above the age of 49, the oldest being 84 year old Shantilal Bhagat. Kausa presents a little known but apparently prolific Bhagat on to the scene re-introducing an old-timer that has apparently been at it for years. Although some may find the artist’s thematic subject matter hard to ingest such as the hallowed portrait of David Livingstone whose face is aglow with a pious aura presenting him in saintly glory. 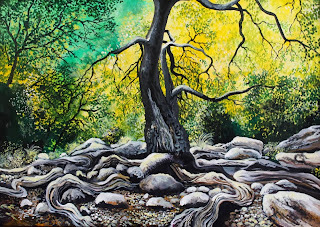 With all due respect – even by means of a town named after him – one cannot presume the British adventurer was a saint, but again art being what it is grants the artist the right to push imaginative boundaries. Nevertheless, Bhagat’s soft Indianesque pallet does not betray his Asian heritage and is quite a delight to look at. Cynthia Zukas MBE also features, but do not expect anything overly new from the 82 year old as from Patrick Mweemba of Choma who is soon to turn 70. They both showcase prints of daily life, although the latter does tend to delve into the abstract. Recently these two artists also featured in the long running Graphic Art of Zambia exhibition at the Choma Museum and Craft Centre (CMCC) that was curated by Choma based Bert Witkamp who also features a few colour prints in “49 Years and Above”. 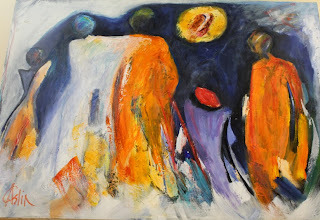 Also featured is Carol Aslin with her signature explosion of intense colours. Her painting The Wedding is particularly fascinating as she manages to portray a couple exchanging vows rendered in just a few smudges of paint. William Bwalya Miko’s work is on show too with his mixed media, crowd-themed chalk drawings whose repetitive multitudes can symbolize anything from the Biblical “second coming” to Zambia’s constitution making process. 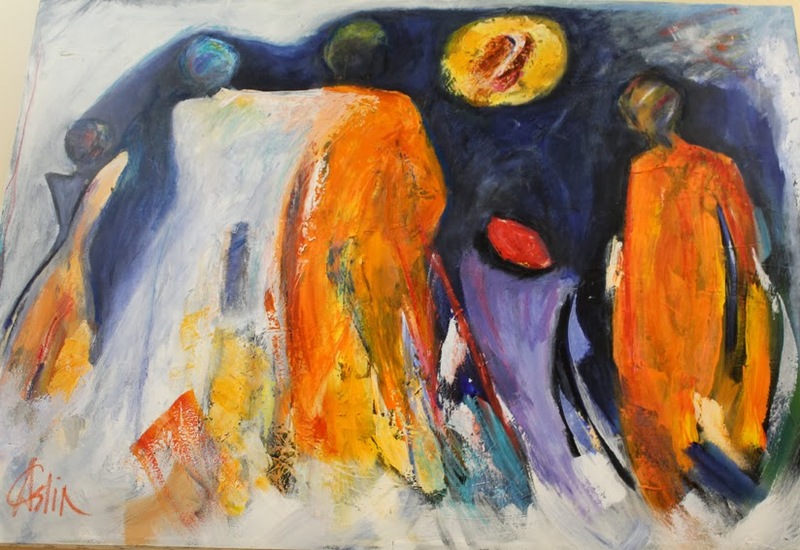 Eddie Mumba and Patrick Mumba – no relation – both have a painting and sculptures in the exhibition. The former has a colourful piece, chequered in small multi-coloured motifs that can represent a host of things, love, fertility or marital harmony whereas the latter has two large scrap metal African masks, that are yelling to be decorative lamps even though this may not have been the artists original intention. Livingstone based painter Lawrence Yombwe’s work makes an appearance too with his signature; Mbusa (traditional Bemba initiation symbols) coded hessian canvases. 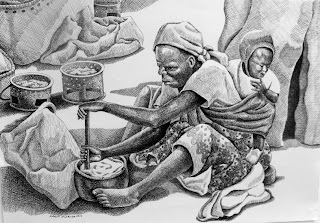 And Adam Mwansa of Luanshya has some captivating pen on paper drawings whose style appears so delicate and ethereal; viewers are often tempted to touch them. But above all Mwansa’s work depicts rural life in its idyllically unadulterated and to a certain extent most impoverished form. Mwansa’s work, was able to catch the eye of Justice Minister Wynter Kabimba who was present at the shows’ opening and booked one of the works for purchase saying “It is just incredible, this guy has good work which I like”, according to Kausa. 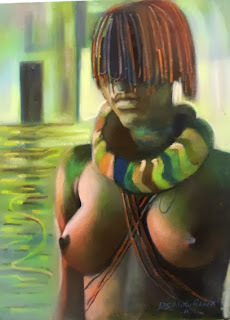 Raphael Mutulikwa’s Moye is one of the most captivating paintings in the exhibition if not for the reason of the artist’s unique, blurred brush style, it is for the eye-piercing nubile breasts of the subject who appears to be a Moye –coming of age – young woman initiate of the Nsenga or Chewa peoples of eastern Zambia, who celebrate the transition by customary ritual and pageantry. Nevertheless, Mutulikwa has taken the art of the blurred brush stroke Sfumato (smoke) as the Old Italian Masters would call it and made it his own. Sfumato is the term; “used to describe the subtle blending of colours and tones to such an extent that they seem subtly to melt into one another, in the words of Leonardo Da Vinci ‘without lines or borders, in the manner of smoke…”, as reads Michael Clarke’s Oxford Concise Dictionary of Art Terms. 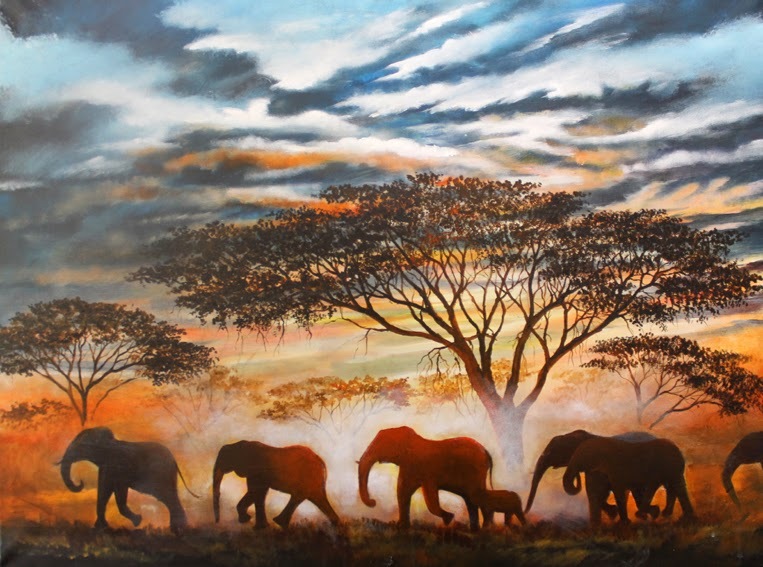 Anyway, “49 Years and above” is not an all Zambian affair, it also features Sheena Povall a very proficient Zimbabwean wildlife painter. She has some very realistic portraits of big cats, one that is in fact so realistic you expect it to leap out of the painting, but luckily as the title reads After Supper; the lion has already eaten its fill, and anyway it is just a painting. In conclusion it appears Kausa’s concept behind the curation of the exhibition was to celebrate, not necessarily document 49 years of Zambia’s independence. 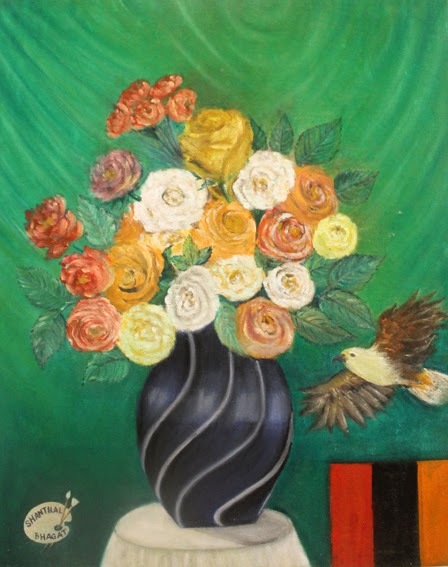 But the title itself as well as the featured artists and there diverse indigenous backgrounds acknowledges both a collective and an individual past without which there would be no 49 years. Of course Kausa’s pick does not include every Zambian artist above the age of 49 and there are certainly some artists who would have been nice to have in the show such as Vincent Maonde, Andrew Makromalis, David Chibwe or the charming Laura Chimowitz seeing it is in principle a celebration of veterans, but anyway, the curators choice is often his own and you cannot include everyone. Besides, there is always next time and if anything next year the nation turns 50, who knows. It may not have been his intention, but by hypothesis Kausa has helped us celebrate not 49 years of Zambia’s independence, but 49 years of the independent Zambian artist. The artist that has been continuously inspired despite his or her economically, academically and publically unsupportive creative environment. Kausa was enthusiastic at the backing given to Twaya Art Gallery by the supporting partners for the exhibition namely Lawrence Sikutwa Associates (LSA), the Garden Group of Hotels, Intercontinental Lusaka and Kash One and events management agency and he highlighted this as the success of the event. He emphasised that unlike in the past Zambian business houses are very willing to sponsor art exhibitions and that artists should take advantage of this. Short biographies of all the mentioned artists are available at Twaya Art Gallery . This year’s Independence Art Exhibition has been a delight to see more than once, having been on display for close to a month at the Henry Tayali Gallery since its colourful opening by Lusaka Province acting Permanent Secretary Bright Nundwe on the 18th of October accompanied by traditional song, dance and drum playing. Recent works by various artists were shown alongside old time favourites on loan from the Lusaka National Museum such as David Shepherd’s Hoisting the Flag (1964) – which shows slight storage or handling damage – and Akwila Simpasa’s Birth of a Nation (1973). These two iconic works were only last seen outside the museum about a decade ago in 2004 when the late Levy Patrick Mwanawasa opened that year’s Independence Art Exhibition as republican president on the State House lawns under the theme 40 Years of Visual Expression. 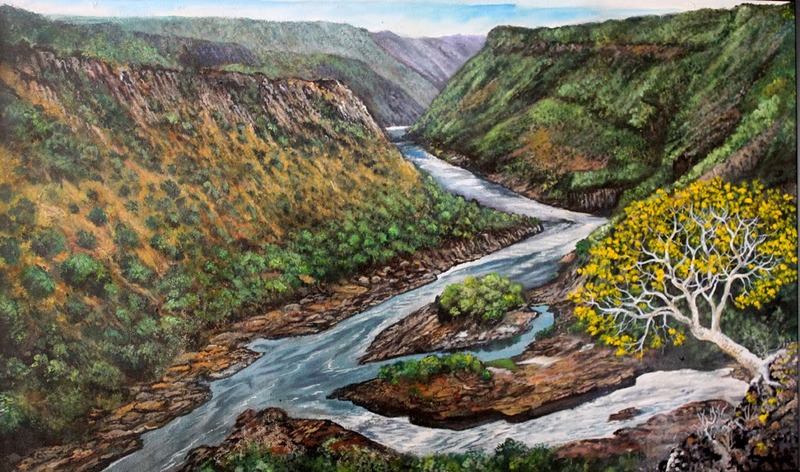 An exhibition he described as “a splendid display of good Zambian art”. Nevertheless, this year’s show was just as splendid – to borrow the word -- considering the limited time in which artists had to come up with work as the call was just made two weeks before the opening. The curators did a good job in spacing out a good number of stone, wood and metal sculptures as well as paintings and drawings by some of the country’s leading artists. “… submit artworks that highlight aspects of Zambia’s independence struggle and the peace and harmony we have enjoyed over the past almost 50 years now,” read the call to artists from the Visual Arts Council (VAC) exhibition committee in part. No doubt the artists tried their best to throw in some aspects related to what they understood as their nations liberation struggle, but like the author none of them were there in 1964 and the few that might have been, were too young to remember, so it is understood when they did not have time to do a bit of pictorial research in the limited time they had to prepare for the show. As for the “peace and harmony we have enjoyed over the past almost 50 years now”, this is an aspect of the exhibition that probably the artists struggled to interpret and sadly so. Often regarded as one huge refugee camp servicing not only the former Frontline States but also other African countries since independence, Zambia has arguably been so peaceful that peace itself has been a sapping force in the area of creativity. Sapping creative expression of any political communication. One would safely argue that peace is so inherent in the Zambian artists themselves that they are unable to feed from their socio-political environment to make work in response to it, rendering most of their work decorative to say the least. For a laugh one would observe that some works by Zambian artists are so decorative they do not even warrant wooden frames but tassels or lace frills around them. Forty-nine years down the line, the advent of independence has barely begun to resolve the imbalances of the legacy of colonialism. In many ways Zambia is still wracked with poverty and underdevelopment in most of its districts and provinces even though it is bursting with potential in many places. But all this is not reflected in art, our art lacks a certain sting or venom that is sometimes necessary for it to lend a critical voice, get involved in the power structure or indeed sway public opinion. Again one would not be wrong to suggest that Zambian art tries too hard to stay away from politics or even the softest form of socio-political commentary, rendering it timid to say the least. As such one is tempted to describe it as ‘Timidly Zambian’ to loosely borrow and adulterate a popular commercial slogan. But this is not to say that the entire Independence Art Exhibition itself lacked any hint of political commentary. One actually stood out among them all and it was aptly titled Political Violence, a painting by Patrick ‘Wadada’ Phiri. 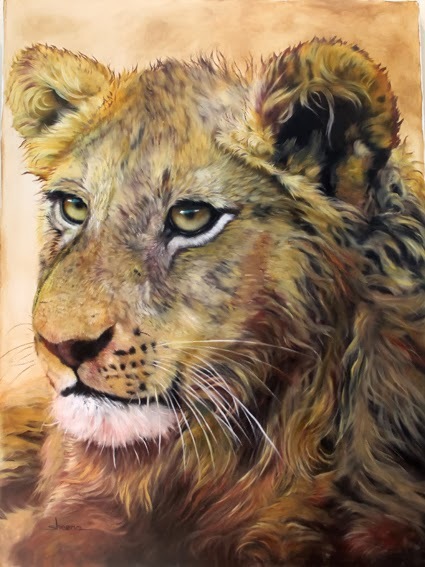 He brings the same creative energy and bursts of colour he showed in the two works Levy Park and On the Move that he exhibited at the Shoprite entrance during the Lusaka Centenary Exhibition at Manda Hill a few months ago. 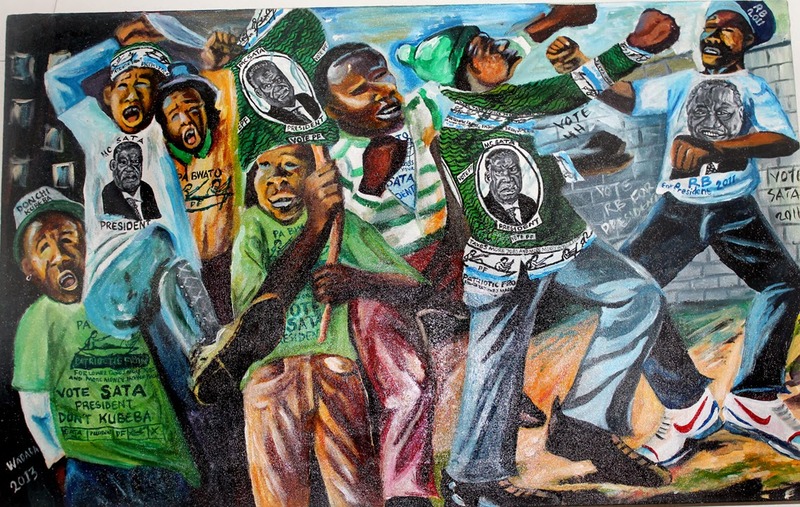 In Political Violence, the artist makes probable reference to the sporadic squabbles that almost cultivated a countrywide culture of violence between Movement for Multi-Party Democracy (MMD) and Patriotic Front (PF) supporters as the latter attempted to take charge of the market places and bus stations shortly after the ruling PF came into power in 2011. In his composition, Wadada continues to prove himself as a skilled visual choreographer. At first glance the viewer’s eye lands on the lone, punch-throwing MMD supporter in a Rupiah Banda t-shirt, but then he directs our eyes from the top right corner past the cadre of PF supporters in a 45 degree straight line, down to the bottom left corner where he has signed his nickname “Wadada”. But the gaze is led right back from left to right at the same angle from the signature, past the supporter in a green “Vote Sata” t-shirt through the frantic rhythm of a raised boot, via the clenched fist of the central figure, and right up to the supporter in a green long-sleeved “Vote Sata” Chitenge shirt whose stretched arm and clenched fist are about to land on the face of the MMD supporter from where the viewer’s eye was led in the first place. Anyway, Mapopa Manda was not to be left out in trying to dabble in political commentary of some sort. The young artist who last year described himself as a political commentator whose work is part of a dialogue that looks deeper into the conflict of interest related to societal development as far as politics are concerned and involved had a very visually energetic work on display too. 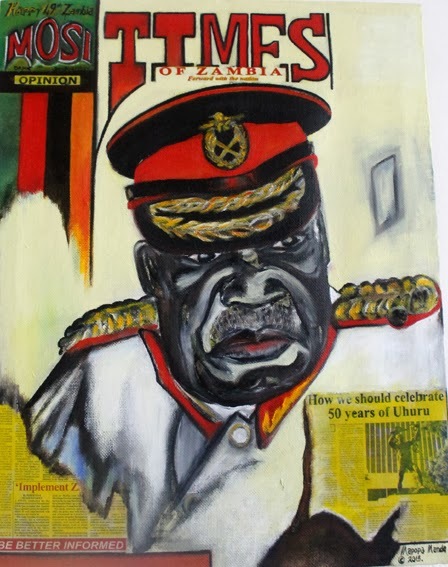 It was one of his trademark, satirical portraits of President Michael Sata on a mock newspaper front page. Unlike his previously exhibited works entitled Plot 1 and Donchi kubeba that depicted interpretations of the president standing with his index finger against his sealed lips in his trademark 2011 presidential campaign “Donchi kubeba” (Copperbelt Bemba slang that loosely translates ‘don’t tell them’ or ‘don’t ask don’t tell’) Independence, the painting in this exhibition depicted a full head and shoulder portrait. He is shown in a white, ceremonial military uniform with his head tilted slightly to the right and his eyes fixed in clock-stopping intensity slightly away from the viewer. The artist brings out all the leaders definite facial features that reflect his strength of personal character portraying him as a no-nonsense man of action. 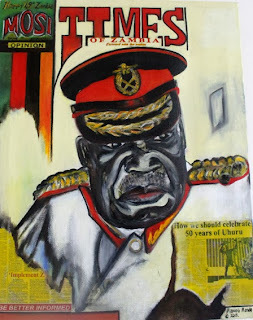 Although Manda painted a Times of Zambia newspaper masthead in this instance, he is also known to use other newspaper banners. “I use The Times of Zambia because it represents Zambia’s political history over the years and then I use The Post because I think it did a great deal to support president Sata and frankly speaking, he wouldn’t be president without The Post” suggested Manda during the Africa My Africa exhibition in May this year. Last year however, he said used The Post because it was formerly linked to controversy and the Daily Mail because he thought its strength was everyday issues. And as for why he called his latest portrait of the president Independence that is up to the artist to know and the viewer to speculate. Such is the beauty of art; after all, what is art without the innuendo of ambiguity? Nevertheless, as earlier mentioned, the Independence Art Exhibition was a delight to view. In every corner of the gallery, all you could see was an immense display of skill, in every splash of colour, stroke of the brush, shade of pencil or scrape of the grinder, who needs. A few of you light-reading devotees of this space may be bored to the core by now with the continued publishing of a series of articles from the African Creative Economy Conference (ACEC 2013) recently held in Cape Town which have pretty much been overloads of statistical information and jargon. Justifiably, you may be hungry for an unassuming exhibition review or artist’s interview, but not just yet. Please allow for one more, the last but not least from the ACEC 2013 which fortunately is less drenched in statistical information. 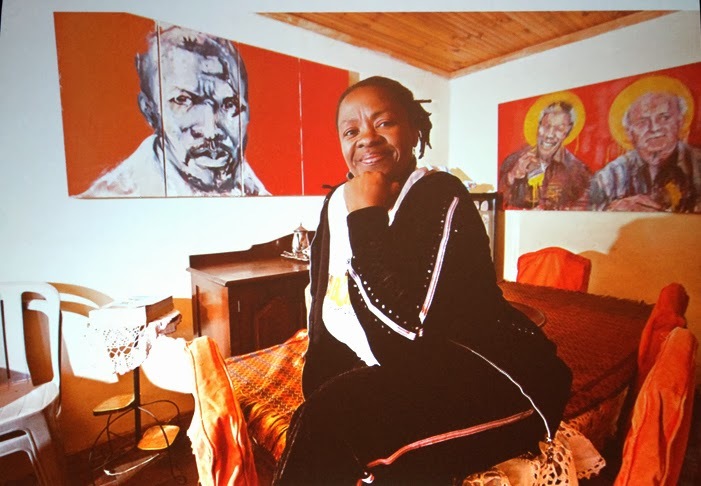 It tells the tale of a humble idea born of marginalization and subsequent rejection that has transformed ordinary township homes into art galleries, giving talented artists a platform to showcase and sell their work, casting to the winds the western system of exhibiting and collecting art. Called the Maboneng Township Arts Experience, it has turned South African recording and visual artist Siphiwe Ngwenya’s township of Alexandra on the outskirts of Johannesburg into an art gallery, and 10 years down the line has expanded to three centres, Gugulethu in Cape Town and Madadeni in KwaZulu-Natal. 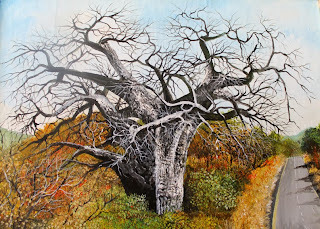 “There are more than 2,000 townships in South Africa alone and there is not too much art going on in most of them. 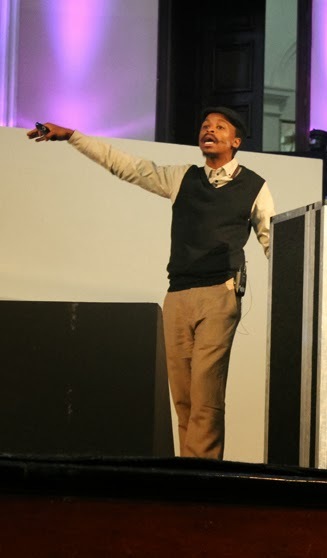 It’s so hard for most artists in these townships to have a voice or join the discourse of the arts, even just to get involved in the economy of the arts; basically that’s the administration, production and distribution, all those things,” Ngwenya told an attentive ACEC 2013 audience, as one of the speakers at the gathering. “I completed my Matric, Standard 10… I don’t know what you call it in other countries but it’s your final year in High School. I had some paintings so I thought I was so good and will be accepted, but it didn’t turn out that way,” explained the founder member of SA hip-hop group Skwatta Kamp. “I walked with some of my paintings to the nearest gallery that was two hours away, and they told me of their two-year itinerary, because they are a busy gallery. 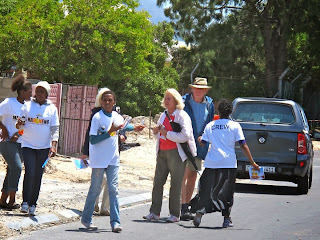 I walked back home, I decided there and then to start exhibiting on the streets”. The same youthful enthusiasm that excitedly drove the artist to a mainstream gallery only to be turned back at the door is the same enthusiasm that lead him to come up with the Maboneng Township Arts Experience because he did not sell his art on the street corners of Alexandra – or Alex is it is also called-- for too long. Realizing that there was not enough art awareness in his neighbourhood and a general perception of art ‘not belonging’ particularly among the youths, he started involving other local artists and encouraging children to see art as a sustainable career path. At this point, Ngwenya and team started exhibiting in houses close to his mother’s home which he says was popular for the sale of fritters. “We call it the Maboneng Township Arts Experience because Alex used to be called the ‘Dark City’ and Maboneng means a place of light in Sesotho,” He explained. He said the township is also known as ‘Gomora Maboneng’ a name which is a remnant from the period that it never had electricity, a time when it was a no-go-area to outsiders, because of the crime. He said there are now about 15 people working permanently on the project and that when exhibitions are on display and the annual festival activities that also involve theatre and dance are in full swing, Alex is the safest place to be, contrary to people’s perceptions mainly due to the townships past. Of course Ngwenya neglected to remind the audience that Alex does have its reputation of violence. The 2008 series of countrywide xenophobic attacks in South Africa started in the Township. It was attributed to an influx of foreigners, largely Zimbabweans whom South Africans accused of taking their jobs. “Those who expect that the townships are very dangerous are wrong. It is a great big lie, locals are hungry for work and they are tired of moving long distances. We have people who we call the ‘Uncles’ or the ‘Johnny Walkers’ that are security guards. Even guys that you call criminals, but we work with them and empower them as our security guards,” he added. “These galleries are homes, you can actually go there and view at any time but you have to buy a ticket from the local ticket store. There is also a huge art buyer market so it is also commercially viable. The home owner becomes the gallery owner, and their kids start working inside the gallery,” he explained flipping through photographs of motherly looking, middle-aged women with welcoming faces seated on cosy sofas in their living rooms with paintings in the backgrounds. A R150 ticket [just above eighty Zambian Kwacha] will get you into any of the galleries. The women actually remind one of the fabled, beer-peddling Shebeen queens of Southern African townships and villages that open their doors to thirsty neighbourhood guzzlers, except of course these highly regarded mother-figures open their doors to people with a different type of thirst, that of a visual arts kind. 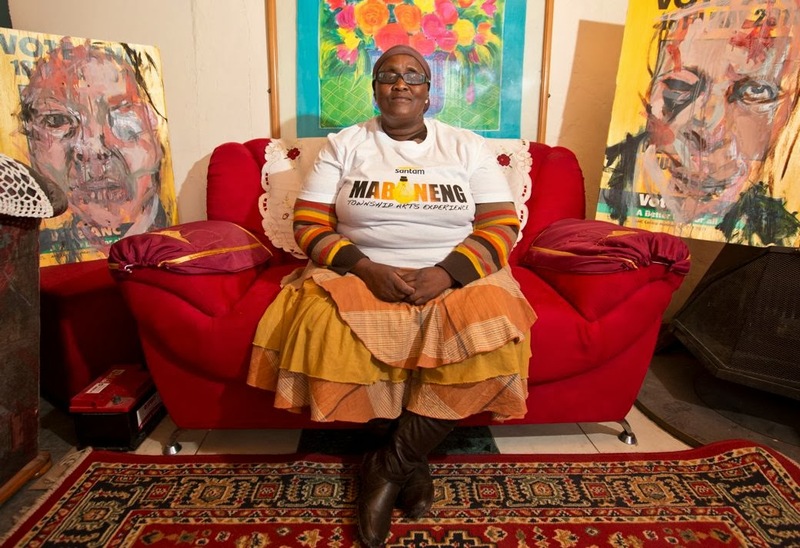 But interestingly, the similarities do not end there, the beer-peddling Shebeen queens’ have their history rooted in marginalization as much as Maboneng’s ‘Gallery Queens’ – if we can call the latter such. The Shebeen queens provided an alternative to pubs and bars, when locals – or natives as it were – were denied entry during apartheid, colonial, and in certain cases post-colonial times depending on which country. Similarly the Gallery Queens are providing space for artists as an alternative for galleries where they otherwise ‘do not fit in’. “These gallery owners will actually sit down with you on their couch not like any other gallery owners you’ve seen before,” said Ngwenya of the ‘gallery queens’. “It is a more interactive experience that the township has. But remember this is real work by proper artists”. But what is probably the icing on Ngwenya’s cake is the library and permanent art gallery that the Maboneng project through the help of partners has put up at his former school. “You can go to my old primary school, [to see art and the library] where my old teachers used to beat me up, pupils use it, but even those who are not from the school often come with their parents,” he said “But this thing is growing. Like I said there are more than 2000 townships and I cannot do this alone. But we also hope to work with townships from all-over Africa; we hope to see this end poverty and misconception of townships all over the African continent”. It may sound ambitious, but Ngwenya’s ambition does have a remarkable track record in its wake. Here is a fellow that grew up in the slums, is a founder member of an award-winning hip-hop outfit that has been at the forefront of urban youth culture, built a library at his old school, turned his neighbourhood into a gallery, has a four storey sculpture at the Raphael Hotel in Sandton and as if that is not enough, went on to serve as co-director of an organization with which he built and took a mobile living station – powered by renewable energy -- to the South Pole and back [ a fact that he did not share on the podium]. 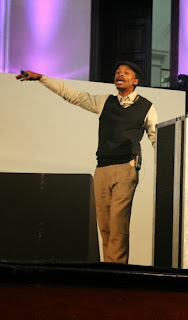 Nevertheless, in his closing remarks to the ACEC 2013 that were overpowered by a round of applause Ngwenya humbly made it a point that he was happy that the Maboneng Township Arts Experience had made people begin to understand what art means and what it can do to change their lives. All in all, Ngwenya is a real life Robin Hood, because whether or not the Maboneng Township Arts Experience is financially lucrative as he claims, it is a delight to know that people in his township now appreciate art. Looking at this South African concept as a Zambian, one can only observe it with smouldering envy and wish such a thing could happen here. There are entire generations of Zambians who are clearly beyond artistic salvation no matter how hard you preach art to them; art will always amount to a pencil and piece of paper. 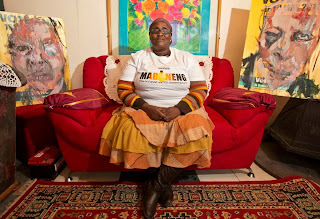 Unlike the gallery queens of Maboneng who are now saved, for them it is too late.